Starts Sunday September 13th, 2015 and ends Sunday September 19th, 2015. Join us in taking the challenge to eat locally for a week! By seeking out what’s available locally, you get to know your agricultural landscape and the community within, connecting you closer to the land and all it has to offer. And, in this transition of summer into fall, there are so many delicious varieties of produce available to try right now! All you have to do is try! You can participate in any way – from Ultra Strict and eating entirely local for 7 days to Ultra Lenient and having just a few tastes of local throughout the week. 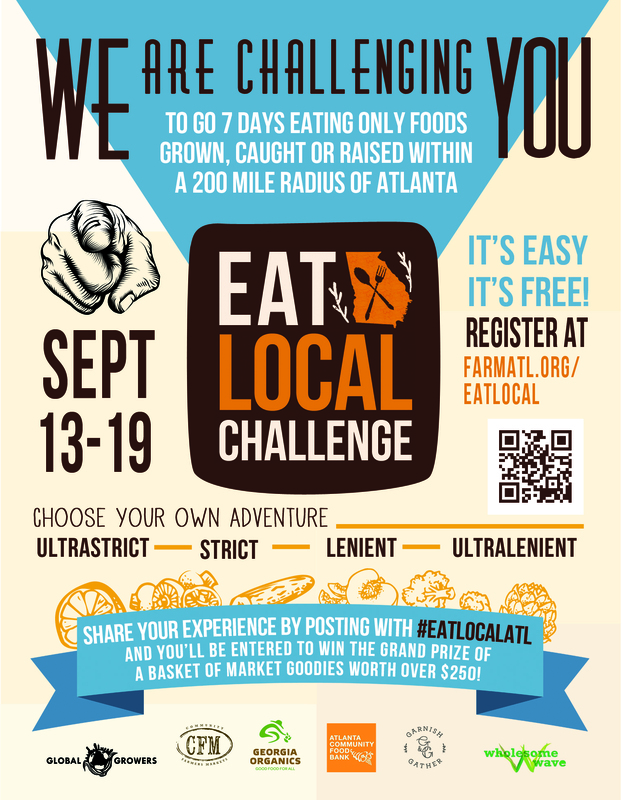 No need to sign up for anything, just share your experiences by tagging us on social media (links & handles below) and remember to include the hashtag #EatLocalATL and you’ll be entered into our raffle to win a gift basket valued at $250! Each time you share increases your chances to win this awesome prize. We’ll post resources to our website leading up to challenge to help you along the way (where to shop & what to make). We have some wonderful restaurants partnering with us to offer local dishes throughout the week, and we’re throwing a dine out on Sunday the 19th. Plus, Global Growers’ Network is hosting their annual Decatur’s Dinner Party, featuring a multi-course menu from talented Decatur chefs. We’ll post on our our facebook pages to keep you up on participating restaurants, so be sure to follow the markets in your neighborhoods, and join our event to get all the info in one place. Just don’t forget to pick up an Eat Local button at our markets!